Armenia, along with Georgia, Azerbaijan, Northern Iran, and Eastern Turkey all form this “Cradle of Wine” region in the Caucasus Mountains where we currently believe the winemaking we know today to have started. Georgia has garnered a lot of spotlight their way which it remains to be seen if they’ll be able to hold on to it. Armenia however, is just starting to be known and has come at things with a relatively clean slate as what I termed a Real World wine region. It would seem obvious to start a conversation about Armenian wine by drawing parallels to its neighbor to the north, Georgia. They share a similar ancient history as well as modern history as they were both absorbed in to the Soviet Union for most of the 20th century. They would also appear to share a similar climate as they are both located in the Caucasus Mountains. But, as big as the commonalities may seem, they end with these broad, sweeping aspects and the details vary wildly between the two countries. It starts with them having completely unrelated languages and alphabets and just goes on from there. Georgia has, according to archaeological evidence, been producing wine continuously for 8,000 years. If you visit there, you will be constantly reminded of this fact while ironically being unable to find any enotourism help in the tourism offices. But, the most important fact was that Georgia was one of the main wine production regions of the Soviet Union (in addition to the Ukraine) and a lot of the infrastructure and vineyards remain. A few of the cellars from this Communist time continue to produce, well, something that could generally be identified as wine but just keep in mind that Georgia has never really stopped producing wine. Maybe it was because Stalin was from Georgia, but for some reason the Soviets decided that Armenia would produce Brandy (despite having nothing in common with the Cognac or Armagnac regions) and so grapes from all the vineyards went into distillation. 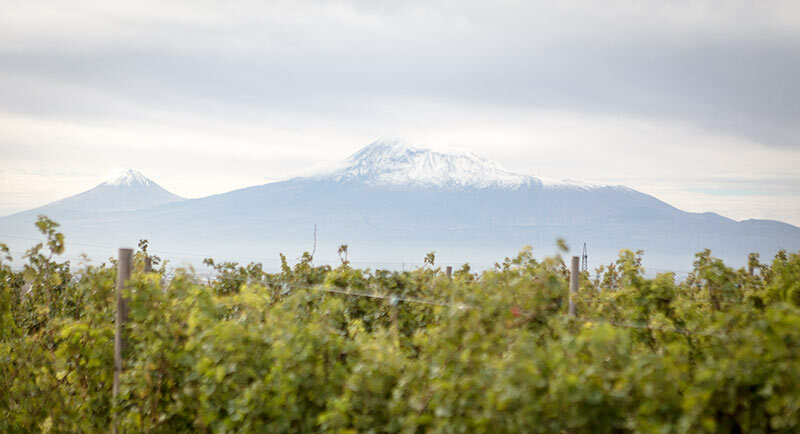 In terms of numbers, Armenia has 17,000ha but only produces 6.2 million liters of wine. For those who don’t enjoy vineyard yield maths, this means that very little of the currently-planted vineyards are being used for wine production (maybe around 1,500ha given their yields) and most is still going into Armenian Brandy. It was only 10 years ago that small, privately-owned cellars started popping on to the scene, with the real jump being in the last five years. There are one or two exceptions but of the 55 producing cellars in the whole country, they have all been quite modern in their founding. Armenia is a high altitude country with its lowest point at about 300m and it just goes up from there. The capital Yerevan, is at about 1000m so despite the latitude on the map, Armenia is a cool climate growing zone and as such it changes the character of the wines tremendously. Like solid acidity in wine? Armenia is going to be your bicycle. While you can see Mount Ararat (which is in Turkey but used to be Armenian land) from what seems to be 1/3 of the country, it doesn’t seem as high as its 5,100m peak actually is due to how high the land all around it is. Just by way of comparison, Georgia starts at sea level where the vines grow in a subtropical region. And while there are some high peaks in the north, its main production region, Kakheti is all below 400m. Despite the altitude, Armenia has a lack of rain and when you drive through it, you can see that it’s very dry country. The rainfall that they see is usually just enough to get the grapes through maturation but at times they do have to irrigate. But due to this, I feel that the vine stress and the altitude contribute to a very unique profile overall that I’ve only seen in other similar high altitude regions. What is most interesting however, is that the Armenians have their own native grapes varieties. While you see some Saperavi and Rkatsiteli from Georgia pop up here and there, most of what I encountered were the reds: Areni and Karmrahyut and the white Kangun (which is actually a hybrid with one parent being Rkatsiteli) although there are definitely others that people are just starting to play around with. Karmrahyut is a very fascinating grape with massive tannins in the skins and one winery owner said was related to Saperavi but I would need to have this verified before stating it as fact. Areni is by far the most interesting of the Armenian red grapes and everyone there likes to call it, “Armenian Pinot Noir”. Well, okay, fine if you must, but it’s not like Pinot Noir nor is it related despite what one winery owner claimed. It’s a grape that I can’t believe hasn’t taken more prominence on the world wine stage as it produces excellent wines. While lighter in color and body, they still have excellent density and I feel like the surface hasn’t even begun to be scratched with this grape. Kangun is acidic as hell which is further emphasized by the high altitude growing conditions. Tasting a grape out of a picking box, it was like putting a lemon in my mouth as it really tasted like it was much more than pH 3 although it could just be that I was over-amped on coffee after a long flight. Despite this, Kangun is not a one trick pony and the grape still holds a good deal of character with citric pith and green orchard fruit notes. Naturally, it lends itself well to making sparkling wines and, much like Areni, I think people will find a good path forward with this grape. So then there is the question of production methods which mostly lean towards the international style of stainless steel tanks and oak barrels. The Armenians have their answer to the Georgian kvevri which in Armenia are called karasi (literally ‘from karas’.) While a slightly different form, they function the same way, but they’re only now beginning to be used. There are some that have an outright disdain for them which was shown when asking a German head of winemaking at one of the wineries if they used them and he matter-of-factly stated, “They’re wax lined, thus neutral and sit upright. Take them out of the ground and you have a tank, which you can control the temperature of and make proper wine in.” Despite that, there’s undoubtedly more work that will go on with them as, much like the Georgian kvevri, they make for some of the more unique wines although I feel that the Armenians are already oozing in unique attributes due to the aforementioned qualities to the country. If you’re wondering about appellations, the Armenians don’t have any official ones yet. They instead have broken down their wines by six regions which are: Aragatsotn, Tavush, Ararat, Vayots Dzor (which holds the Areni-1 ancient wine cellar), Kotayk, Armavir, and then Yerevan. Like other regions re-developing their wines in a historic setting, a winery in one region will often source grapes from all over, thus why they could really use some appellations very soon lest you end up with an Armenian “soup” instead of a wine driven by terroir. There’s one important thing to note in here which is that the contested Nagorno-Karabakh region (also known as Artsakh) is legally part of Azerbaijan but also produces wine which is then labelled as “Armenian Wine”. The independence of this region is a contentious issue which makes for regular border skirmishes between the two countries. Oddly enough, it seems that contested areas seem to make good wine and the one or two bottles I tasted from this region were quite elaborate, much the same way that the wines of Golan Heights in Israel were what I felt to be some of the best. Given labeling laws, I don’t know how this is going to work for import in other countries as stating “Product of Armenia” is false. The production levels are so small to date that I’m sure this issue isn’t much of one, yet. Armenia was a much more interesting wine region to visit than I thought it would be due to Èlia (who also writes here but edits a great deal more) having gone there in February of 2013 and found the wine scene very, very underdeveloped. In a scant 3.5 years, they’ve come light years and it seems like they will continue to evolve and grow. If they manage to learn from the missteps that their neighbor to the north has been making, they’ll easily be able to branch out beyond their base of wine sales to Armenian expat restaurants and much more into the mainstream. Great article, I would love to visit. Just a note though, my company focuses on enotourism in Georgia, so there are services. The issue is infrastructure and nepotism. If you look at that again, you’ll see that I’m talking about government-level enotourism “efforts” in Georgia such as in the ill-equipped tourism offices or the completely wasted opportunity which was the UNWTO Wine Tourism Conference for that matter. At the private level, there’s no end of offer. Very nice and concise piece, nice to see you made it there. We too, like Areni from Vayots Dzor and Khndoghni from Karabakh. The strides they make in such a short amount of time are huge, last year the whites made from Voskehat were too earthy and without much fruit and acidity. This year the new vintages of Voskehat are crisp and delicious.